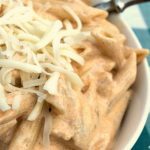 Make this delicious and easy recipe for Crock-Pot Buffalo Chicken Pasta for dinner soon because the flavor on this is out of this world! Tender chicken and a spicy (but not too spicy) sauce is cooked in the slow cooker and then tossed with pasta for a dish that is out of this world! 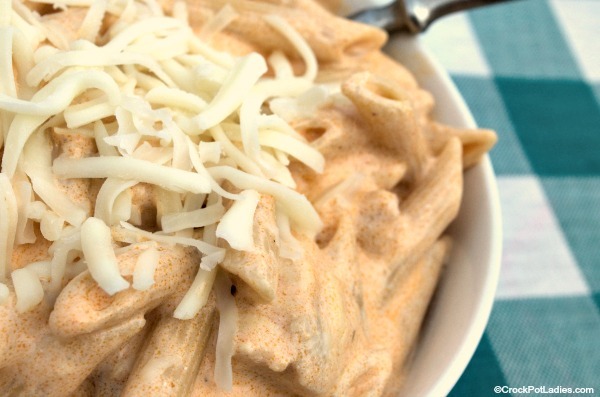 This recipe for Crock-Pot Buffalo Chicken Pasta was originally sent to us by one of our readers, Wanda Cochran. We are updating our older reader recipes so we have a picture for the recipe and we can make sure the recipe works well with the instructions we have. 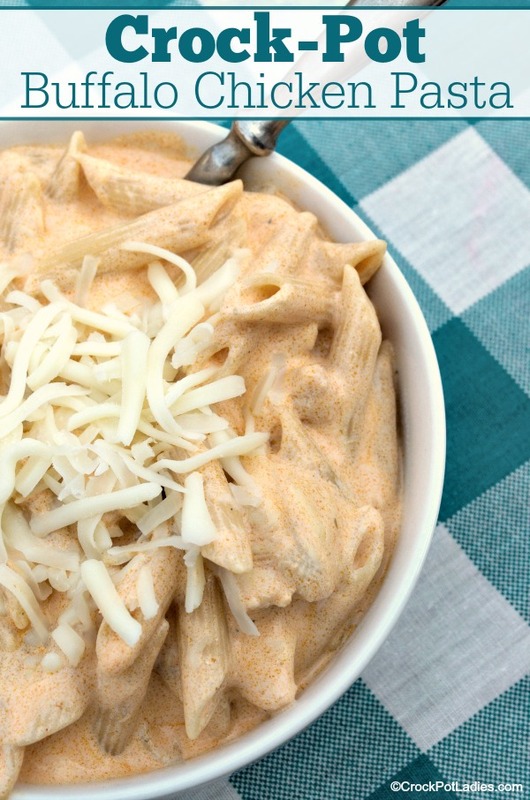 This recipe is a tangy, original way to make a buffalo chicken recipe. Use a regular or hot wing sauce or even a tangy BBQ sauce if you don’t have wing sauce handy. I had chicken tenderloins on hand instead of chicken breasts so that is what I used and found they were so easy to cut, that I may stick with them for most of my crock pot recipes. I generally HATE having to pre cut the raw chicken, but the tenderloins were simply a breeze to slice through. No change in taste either. My family enjoyed the meal, several of us ate it for seconds the next day. Will definitely have to cook this one up again! Tender chicken is simmered for hours in a creamy and tangy sauce and then served over pasta for a dinner entree that is out of this world! 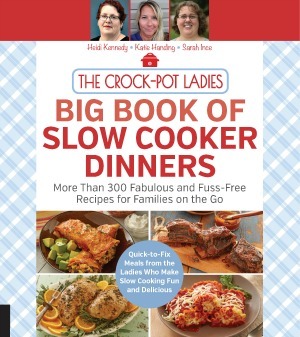 Line a 6 quart slow cooker with a Crock-Pot Liner or spray it with non-stick cooking spray (optional). In a small bowl mix together the cream of chicken soup and buffalo wing sauce. Place bite sized chicken in the slow cooker and pour sauce over the chicken, tossing to coat the chicken in the sauce. Cover and cook on LOW for 6 hours, stirring once in the middle of the cooking time if you can. When the chicken is done cooking, cook the penne pasta according to the instructions on package. Add the ranch dressing, sour cream and mozzarella cheese into the chicken and stir well. Once pasta is done, drain and add to the crock and mix well and it's ready to be served. Enjoy! Feel free to use low-fat ingredients to make this recipe a little healthier. Low-fat cream of chicken soup, sour cream, ranch dressing and cheese will all work fine. Don't however use fat free as they don't cook up quite the same.